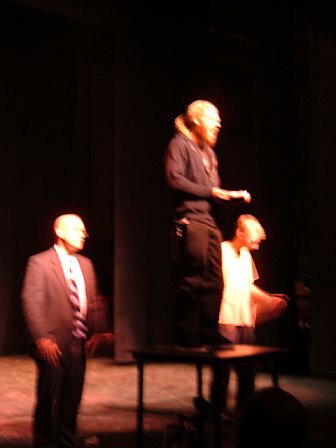 Al stands on a table center stage. He is flanked by James and Jamal. Jamal incites the audience into stomping and clapping. Once everybody has a good rhythm going, Al recites the following lines, reading from a bible he holds in his hands. James and Jamal will repeat everything he says. When the singing is over, Al walks off the stage. CD recording from the original album. "Mariachi Nightmare" can be found on the Negative Dirt album from Angry Lemon Music.